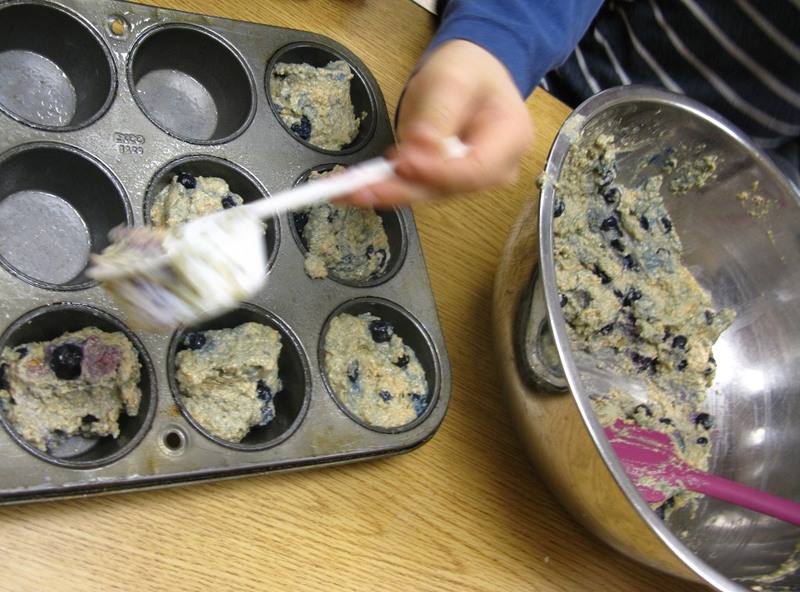 When I told the kids in my fifth-grade food appreciation class we’d be making muffins sweetened with apple sauce and orange juice and blueberries instead of granulated sugar, they literally turned on their heels and ran out to the playground. No kidding. I was left standing there alone with a dumb look on my face. I’d hoped to teach them that baked goods don’t necessarily need sugar. Maybe I shouldn’t have said anything. The incident illustrates the lengths to which kids sometimes will go to avoid “healthy” foods. Still, we try to introduce healthier options. Sugar is probably the biggest villain in our current dietary woes, and most of us don’t get enough whole grains–or fiber–in our diets. So don’t be afraid to make these muffins at home, since they are rich in fiber and don’t contain any granulated sugar at all. In fact, I used to make these muffins all the time for my private clients who requested healthier meals. They will keep a long time in the freezer. To make 12 standard muffins, stir together in a large mixing bowl 1 1/2 cups oat bran, 1 1/2 cups all-purpose flour, 2 teaspoons baking soda, 2 teaspoons baking powder, 1 teaspoon ground cinnamon and 1/2 teaspoon salt. In a separate bowl, blend 2 eggs, 1 cup plus 2 tablespoons apple sauce, 1/2 cup orange juice, 2 tablespoons canola oil and 1 teaspoon vanilla extract. Pour the wet ingredients into the dry ingredients and mix until just incorporated, then fold in 1 1/4 fresh or frozen blueberries and 1/2 cup chopped walnuts. Scoop the batter into a greased muffin tin and sprinkle rolled oats over the batter, pressing lightly with your fingertips. Place the muffin tin in a 400-degree oven and bake approximately 18 minutes, or until a toothpick inserted into the middle of a muffin comes our clean. Serve these warm, with a glass of first-class buttermilk. You mentioned applesauce in the lede, but I don’t see any on the ingredients list. Is it possible that something is missing? Thank you and good catch. There should be 1 cup plus 2 tablespoons apple sauce in there. I will make the correction.